A simple tap on this luminous LED ring will transform any room with a dazzling display of colored light. Ask anyone who has spent an extended period of time working under harsh, fluorescent lights and they're sure to confirm that both light and color have the power to change our mood, for better or for worse. Isn't it time that we let our emotions color the way we'd like to see the world? With a simple tap, the luminous LUNE can transform any room by emitting seven distinctive colors, each with an adjustable light intensity. The LUNE's sculptural, ring-shaped silhouette absorbs and reflects the lamp's different colors, and its intuitive touch sensor lets you control the lamp in a way that's both easy and fun! Use the LUNE to create the right atmosphere for any occasion: Switch on the sunny yellow to cheer up on a gray morning, fire up red for a wild fiesta or cool things down with a deep-sea blue for a low-key dinner party. Or, when one color simply won't do, switch on one of the two automatic modes to showcase a rainbow of hundreds of colors in slow or rapid succession. The LUNE uses a unique LED platform, and since it sips just 9 watts of energy and will last over 50,000 hours of continual use, it's friendly to the environment and to your electric bill! With a panoply of vibrant colors, intelligent LED technology and superb design, the LUNE lamp provides the perfect accent to any room. Made in China. Boys have gone loonie for the Lune! I gave the first Lune to my 12-year-old son for Valentine's Day; it is getting harder and harder to find things for him that he really likes. The Lune was a major hit! Even though he is 12, he still likes some light in his room and night, and the lava lamp wasn't cutting it any more. The Lune's many color options offer choice and fun at the same time. He loves it, as does everyone who has seen it! Enter the 10-year-old. "I want one!" Fortunately, he had a birthday coming up soon, so he now has his own Lune. He was super excited when the box arrived; he guessed immediately what it was. Now each boy has a Lune in his bedroom. Only my husband and I are jealous now... The Lune is not inexpensive, but the cost was worth it both times for the grins! Two years ago I gave this to my college student son. It is now gracing his apartment. He has loved it. He uses it all the time. He was "living in the dark" in his dorm room, studying by the light of just the computer monitor! Ugh. I believe the color changing feature kept his moods upbeat thru stressful times. It can also be used in any one color, or just the bright white, which actually does illuminate a room. The tilting/pivoting feature directs the light upwards, or just downwards for soft mood lighting. Used in the bedroom as a nightlight. Does not heat up. Uses less power. Looks sleek and stylish. Nothing at all bad to say about it. Worth every cent paid. We can't beleive how much light this little lamp can put out. Perfect for movie night! I just needed a lamp, yet I wanted something unique. This fits the bill. The way the lights rotate reminds me of Christmas and that's always a good feeling. The product video on the site taught everything about turning on, adjusting the scope & alternating colors, so no instruction reading required! Use this product in office and room, beautiful design, setting are great and you can dim the light if you wish. Present was well received. Unique, Sleek, Colorful . . . Love it ! I love this light! It has sleek, clean, comtemporary lines, and it is very colorful & unique. 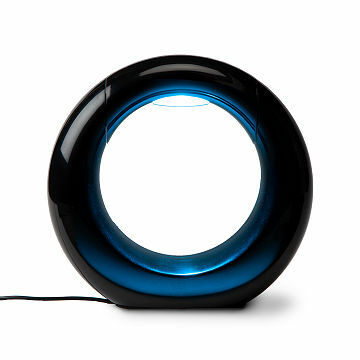 Great for mood lighting, as a soft night light, or as a low light when you are watching TV. It has 9 color settings and is dimmable. Would definitely recommend this beautiful light for anyone looking for something useful as well as unique. I bought 3 of these for Christmas 2013 gifts--for my husband and stepsons (ages 24 and 21). They all LOVED it. My 24-year old stepson even sent me a text 2 days after Christmas to say how much he and his girlfriend were enjoying the LUNE light in their apartment. Based on the positive reaction from my guys, I plan to buy 2 more for my college-age nephews. Well worth the money!